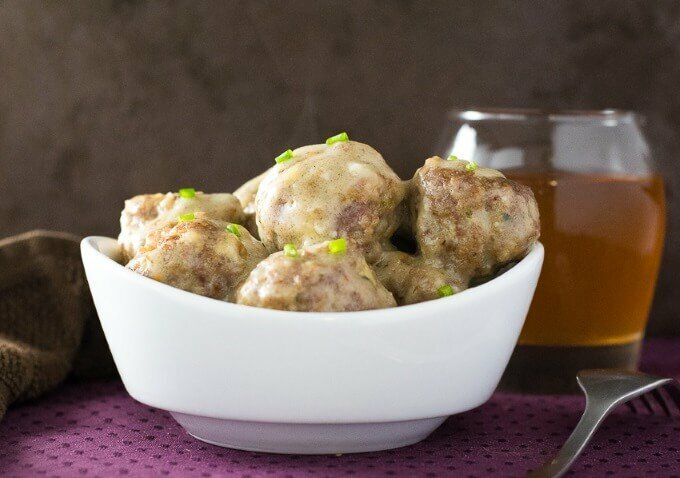 Serve these tender Cocktail Meatballs in Garlic Butter Sauce for an easy to prepare party appetizer that is sure to be a hit! Your guests won’t be able to get enough of this luxurious sauce for meatballs! Saying ‘you ran into someone at the grocery store’ sounds a lot better than saying you ran into a stranger at the grocery store while spinning the cart and making car noises. Yeah, some guy was just looking for the best deal on a can of soup when I hit him with my shopping cart/race car in an attempt to make my daughter laugh. In the end, I did get my daughter to crack her infectious smile, so it was worth it. I needed to get ingredients for these Cocktail Meatballs in Garlic Butter Sauce, but it was a pretty quick shopping trip since each ingredient is pretty much a staple in my house. I suspect if you look in your pantry you’ll find you need an abbreviated shopping list for these as well. 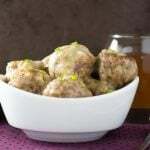 Cocktail Meatballs in Garlic Butter Sauce make a great party appetizer not only because they are easy to prepare with the ingredients you have on hand, but more importantly, they taste great. Seriously, garlic butter is one of the best sauces for meatballs! You will probably want to make a double or triple batch to satisfy your guests. There are a couple of tricks to making tender meatballs that don’t taste like tough, overcooked meat rocks. The obvious first consideration is the ingredients. Adding breadcrumbs, in particular, are important because they not only do they help hold moisture inside the meatball, but they also yield a more tender mouthfeel to the beef, allowing it to break apart more easily when eaten. The second trick is not to overwork the meat. Pressing the meat hard with your hands in an attempt to combine it with other ingredients or form the balls will only serve to create an unappetizing dense ball of meat that is tough to chew. Instead, crumble the beef into smaller bits with your fingertips and gently mix with the other ingredients. When forming the balls, only apply as much pressure as is needed to create the shape and get everything to hold together. I think the ideal size of a cocktail meatball is slightly smaller than a golfball. Finally, for easy cleanup, I recommend using these nonstick baking mats from Gourmet Boutique Chic. I love them because the meatballs don’t stick to them while baking and I can just through them in the dishwasher when done. No burnt on crud to try to scrape off the pan. The above link is an affiliate link. Any Amazon purchases made through this link help support FoxValleyFoodie.com without any additional cost to you. 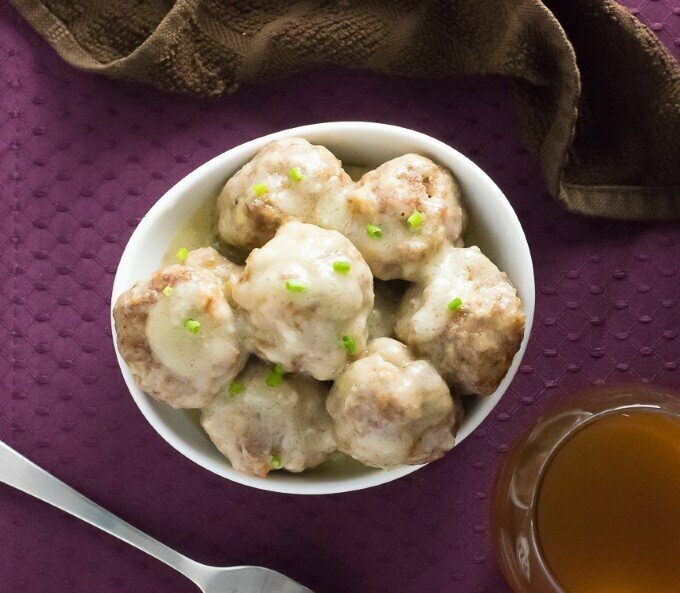 Serve these tender Cocktail Meatballs in Garlic Butter Sauce for an easy to prepare party appetizer that is sure to be a hit! Your guests won't be able to get enough of this luxurious sauce for meatballs! Gently crumble the ground beef into small piece and add to large bowl. Add remaining meatball ingredients and gently combine everything together. Place into oven preheated to 400 degrees for 15 minutes, or until cooked through. Though the time will vary depending on the size of the meatball. 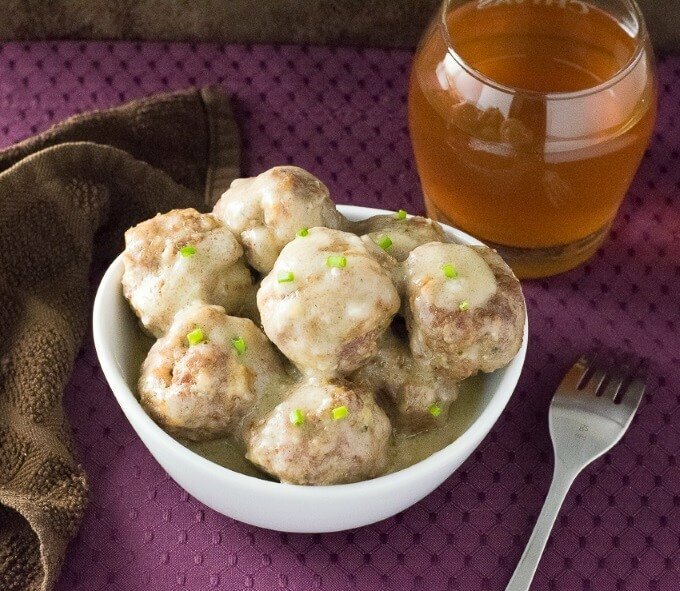 While the meatballs are baking melt butter in a saucepan and saute garlic for 1-2 minutes. Stir in flour and cook for an additional two minutes to cook out the flour taste, stirring continually. Finally, add chicken broth and bring to gentle boil. Cook until the sauce thickens to the consistency of gravy. Add meatballs to the sauce and keep warm in slow cooker as needed. Italian breadcrumbs can be substituted, just cut back the Italian seasoning used to 2 tsp. Do you know what goes with cocktail meatballs? My Jalapeno Popper Pinwheels would be a perfect addition to your party spread! This recipe was originally published on FoxValleyFoodie.com November 20, 2015. If you enjoyed reading my Cocktail Meatballs in Garlic Butter Sauce recipe then you should probably like me on Facebook and follow me on Pinterest too. That’s what I would do at least, because if you don’t get to know me but you still use my recipe it is kind of like taking candy from a stranger, and your mom taught you not to do that. Don’t disobey your mom, subscribe to Fox Valley Foodie today. This is perfect for watching the football game.